It's going to be Christmas in 2 days! Hurray! Christmas brings such happy memories of good times spent with family and friends. I can still feel my childhood excitement waking-up before dawn to see what was under the Christmas tree. One particular Christmas, when I was around 7, I got a musical toy. Our house was full and there was no place to play as it was annoying the elders. So after lunch, I hid in the cupboard of the bedroom before my dad went to bed. I kept playing the machine for over an hour while he was trying to figure out where the noise that was not allowing him to sleep, was coming from! LOL! Christmas is fun. One of the main staples of Christmas, other than the Christmas Tree and Santa, is the Christmas Cake and assortment of Christmas Cookies. Christmas cakes are usually made in advance, kept in an airtight container and fed a small amount of brandy, rum or whiskey every week until Christmas. There are many version of Christmas Cake with each country or region adapting Christmas Cake with the fruits common in that area. The Middle East Region is no exception. Growing up, I don't remember ever being fond of Christmas Cake or any Fruit Cake for that matter. That was until I tried this version of Christmas Cake at a friend's house. It is a lighter version not overly soaked with alcohol and with an amazing flavor. I like to think of this Christmas Cake as the Middle Eastern version of Christmas Cake, for it includes includes dates - a favorite of mine - and almonds, plus a variety of spices that are popular in Middle Eastern cuisine. And the best thing about this Christmas Cake is that you don't need to make it way in advance and feed it, you only soak the fruits in alcohol in advance. 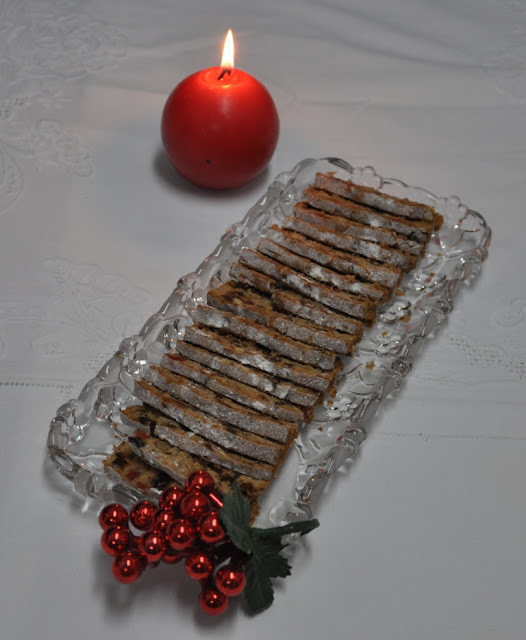 What is even better, is that if you are not an alcohol consumer and like to stay clear of it - as many people in the Middle East region don't consume alcohol - you can prepare a non-alcoholic version of this Christmas Cake and it tastes wonderful. Soak the raisins, dates, fruit mixture, walnuts and almonds in brandy in an airtight container for at least 24 hours going up to 7 days. For the non-alcohol version soak in orange juice. After the soaking time, preheat oven to 270° F. Grease and flour the sides of 4 medium loaf pans. Line the bottom of the pans with wax paper. Place all the remaining ingredients in large bowl. Beat until you get creamy mixture. Stir in the soaked fruit and nuts until well mixed in the batter. Scrape the batter into the prepared pans. Each pan should be filled a little below half. Bake for about 1 1/2 hour until golden and inserted toothpick comes out clean. Note: You can prepare cake one week before Christmas and wrap it with aluminium foil and store in the fridge. Slice the cake. I like to slice my cake with an electric knife to ensure that the slices come out clean and there are no crumbles. Hope this year you try the Middle Eastern version of Christmas Cake. Hope you enjoyed today's easy recipe: Christmas Cake. Bon appetite and Merry Christmas to all. My favorite Christmas cake. Thank you Seta for giving me one every year,which seems to disappear quickly in our house.